Have you ever been craving that taste of apple crisp, but haven’t wanted to make an entire pie? Well now you can have a single serving, and guilt free!! No longer feel bad about eating this simple, 15 minute version of an apple crisp. 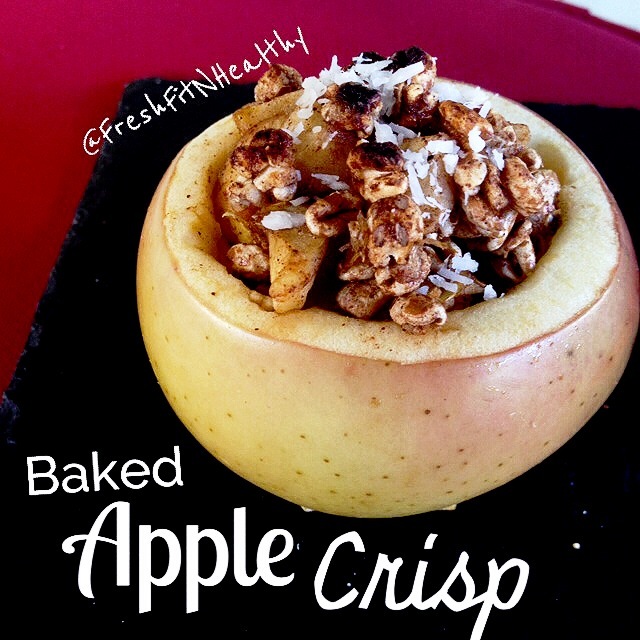 Served in an apple bowl instead of that buttery pie crust, this is definitely a healthy treat! And it is so quick and simple, anyone can make it! Will you be?! Apple Crisp along with anything pumpkin or chocolate is probably one of my favorite holiday desserts. What is yours?! Directions: Hallow out apple on inside, leaving enough of the apple for a “thick bowl”. Be careful not to break or pierce sides or bottom of apple. With the removed apple from inside, chopped into pieces, mix with half of the honey and cinnamon, and place back into the apple “bowl”. In a little bowl, mix together the oats, the rest of the honey and cinnamon, and salt. Place this topping mixture on top of the apple to fill to the top. Place in preheated oven of 350 degrees (or even in a small toaster oven), for about 7 minutes. Switch over to the broil setting and continue to cook for about 2 minutes, or until the top is browned. Remove from oven and enjoy! Can top with unsweetened coconut if desired. Yes. It happened. In my kitchen. Today. Why?? Well last night I went out with my boyfriend and found this at our local frozen yogurt place in Gainesville. And the best part? 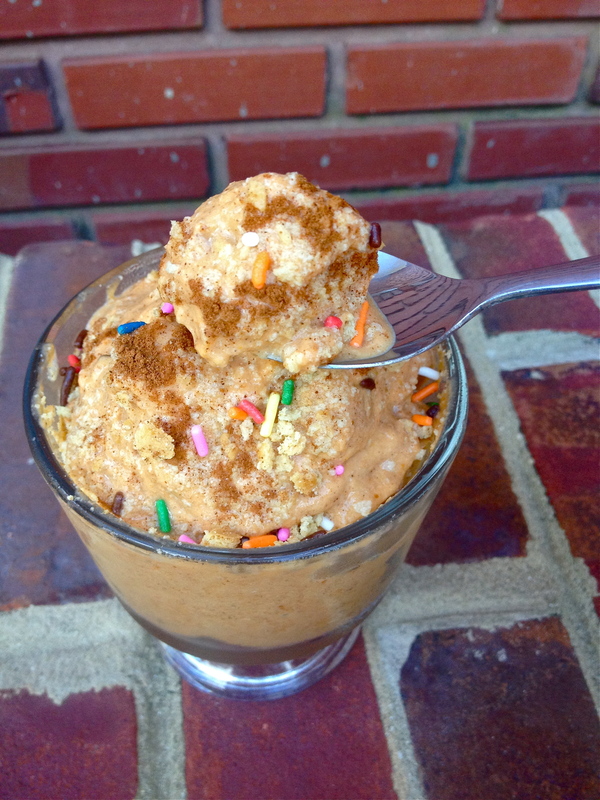 No ice cream maker needed if you don’t have one! Once you make the base recipe, you can either pour it into a maker if you already have one, but if not, just pour it into a shallow container and place into the freezer! Stir every 30 minutes until the right consistency is achieved, and wallllah! Directions: Combine all ingredients in a bowl and mix until all ingredients are evenly incorporated. 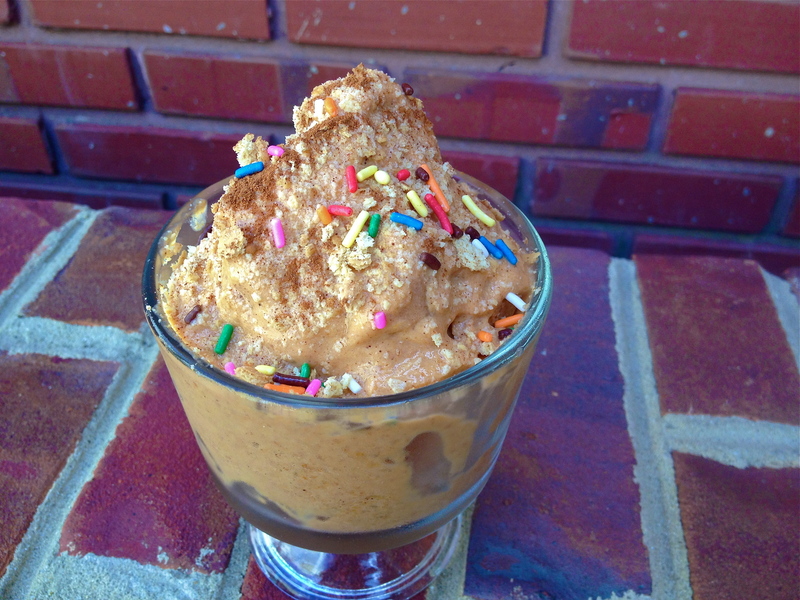 Pour into ice cream maker according to directions on maker, or pour into a shallow container and place into freezer. If not using an ice cream maker, you will need to check mixture every 30 minutes to an hour and stir, in order to break up any huge crystals from forming, until the desired “frozen yogurt texture” is achieved. 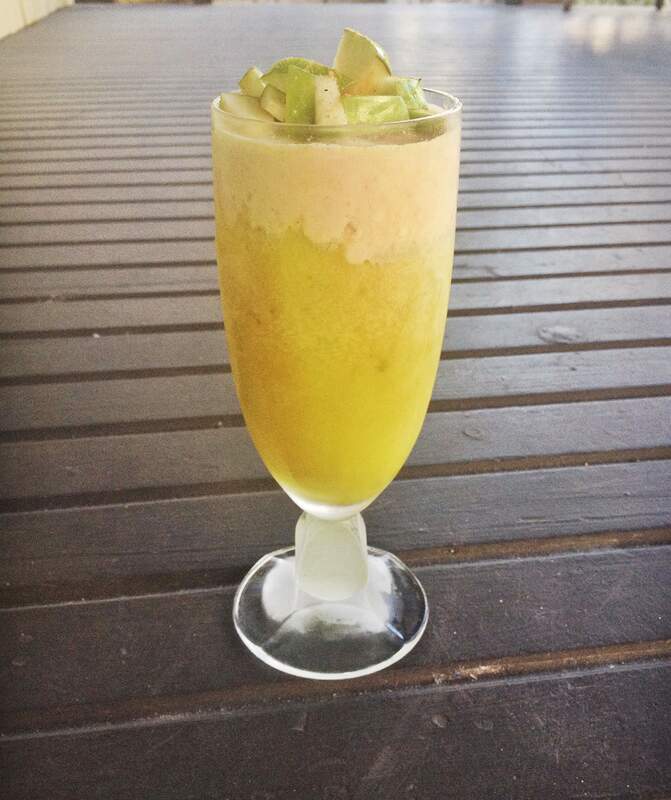 This will not produce as good as results as an ice-cream maker, but will still taste just as great. Serve in bowls. Top with any desired toppings! But another thing I love is yogurt! It is such a great thing to have on hand as it is so versatile, I know I use it every day at least once! It is great on its own with fruit, added into smoothies and shakes, or even as a great base for sauces and dips instead of your typical mayonnaise or sour cream! 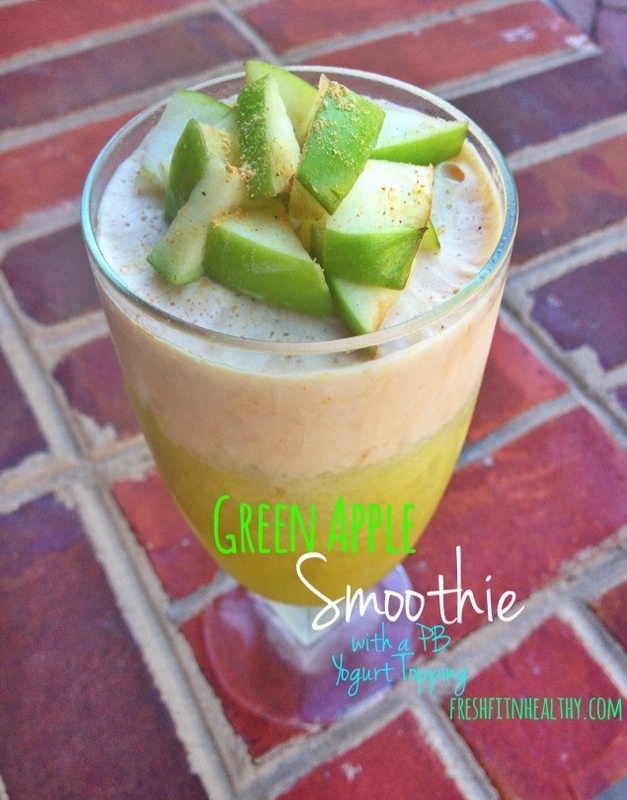 This is a protein packed and delicious way to start off your morning! And it is so easily tailored to whatever you like. Switch out the fruit for another kind, add in your own spices and extracts, and you could have a whole different breakfast! Certainly a great choice. And guess what? I even sneaked in some of those wonderfully nutritious little seeds called chia seeds. It is such a great way to make a thick yogurt or pudding consistency! They have so many benefits, but one of the greatest being hydration (read all 10 below recipe!). 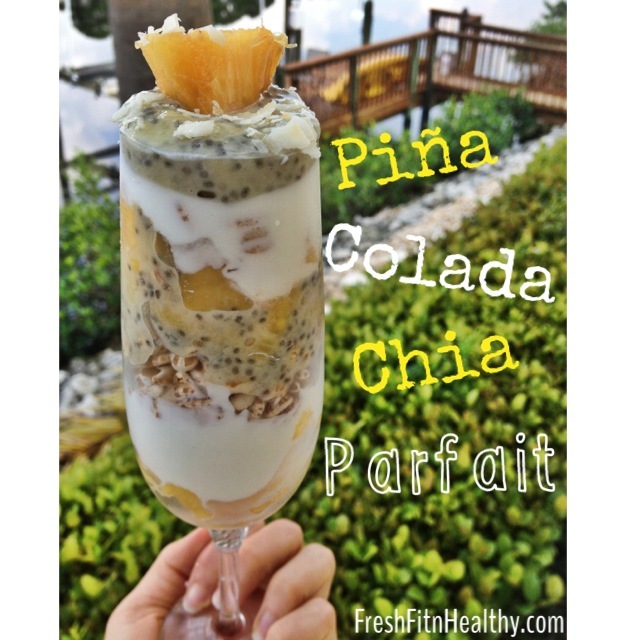 Haven’t tried chia before? You should give it a try! Very tasteless yet adds a great texture. Plus, you are offering your body amazing nutrition through using them! Directions: Mix all ingredients for banana pudding layer together in small bowl. Set aside in fridge to thicken. Mix together all ingredients for coconut layer together in separate bowl, set aside. 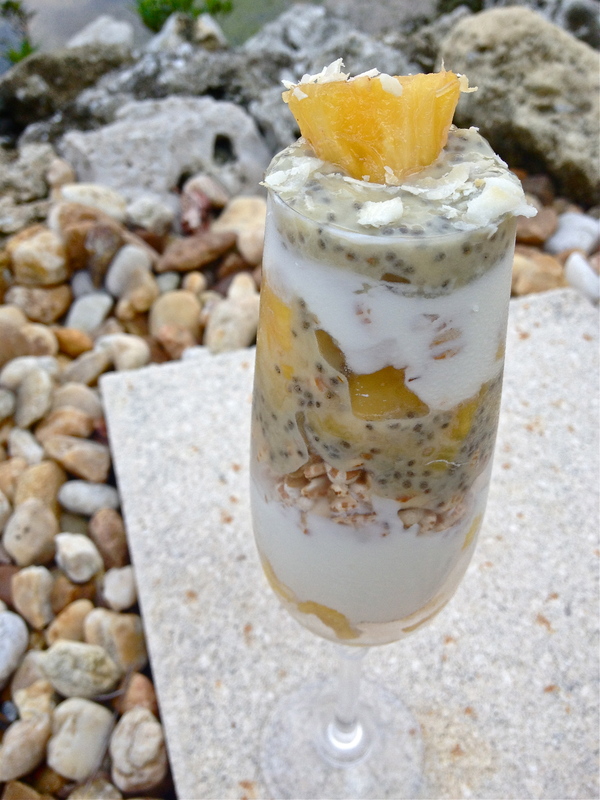 In a parfait glass or (or type of cup), Place a layer of pineapple, then banana pudding, then 1/4 cup cereal or 2T oats. Repeat once more. Enjoy! 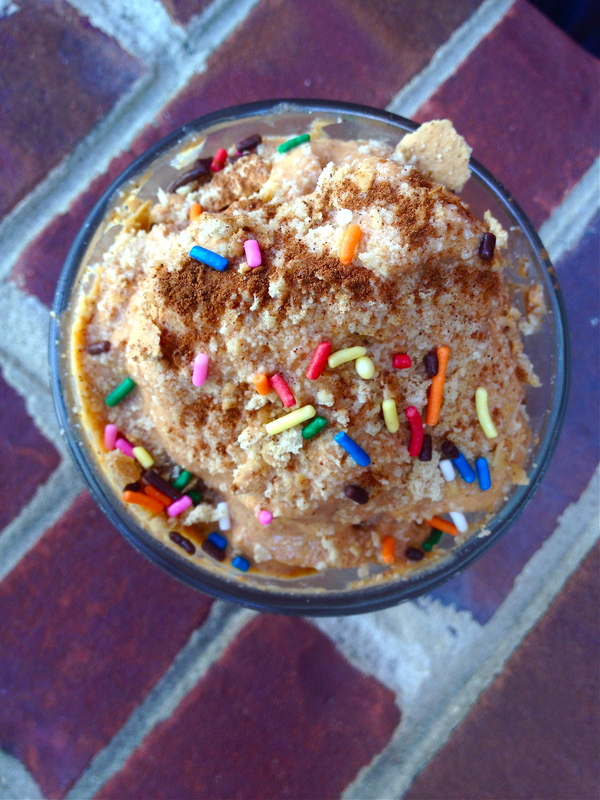 It’s never too early to start using pumpkin in recipes. Is it just me, or does just thought thought of the holidays and the smell of those fall flavors put a smile on your face? It just makes me so happy! 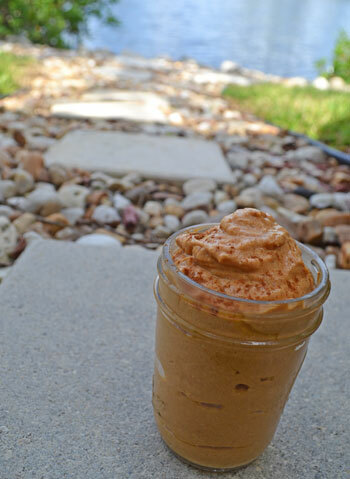 I use to absolutely love making a pumpkin cream cheese. But see, I had a problem. The low fat version still had a lot of calories for the amount I would go through of it (2 tablespoon serving size?! I think not). But then the fat free version was just filled with all sorts of artificial ingredients and fillers for the lack of fat. So yesterday I came up with a solution for this problem. And the solution was delicious. Low in fat, high in protein, and still that delicious creamy taste of cream cheese! Whats your favorite holiday flavor?? I guess mine isn’t too hard to guess! Directions: Blend all ingredients together until smooth. Keep in jar. 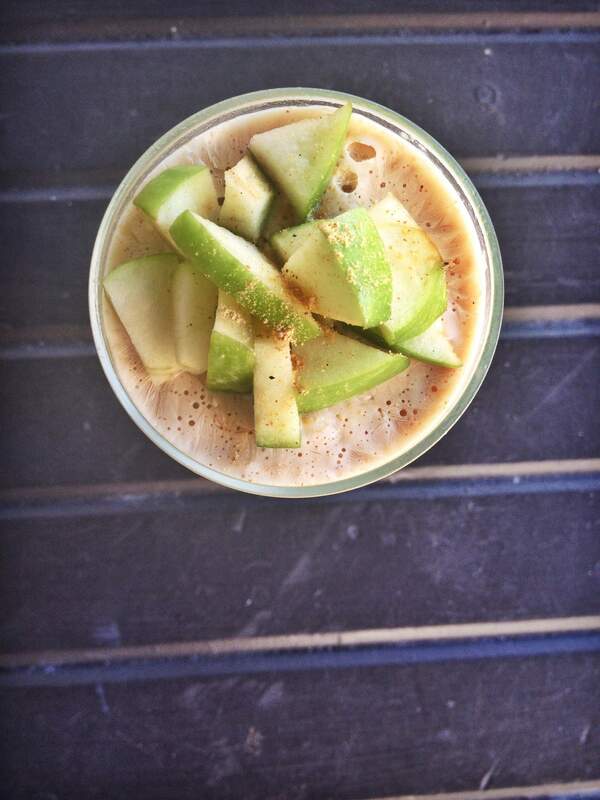 Use as a spread on toast, a sweet dip, or even a simple add-in into oatmeal or shakes. Who said kids are the only ones allowed to play with their food? I’m not sure about you, but one of the best combinations I can think of growing up that I am still not sick of, is peanut butter and honey toast. If you haven’t tried it, please do. When thinking of what pancake flavor I wanted to make next, I looked over to my little honeycomb honey jar I keep out on the counter, and right then I knew. 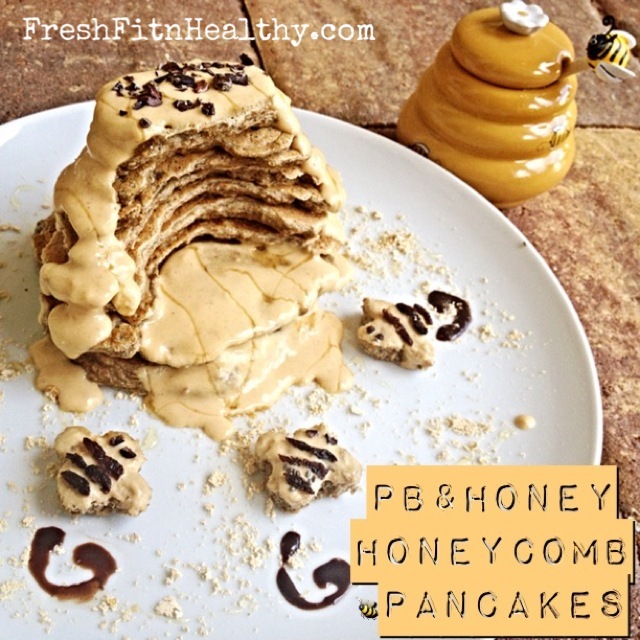 I needed to recreate this peanut butter and honey flavor in a pancake! Since incorporating some sweetener back into my life after my sugar detox, I have gone to raw honey. It is delicious, and so healthy for you. Unlike processed honey, it contains many vital nutrients and antioxidants that aren’t killed from the heat that the typical honey undergoes. So, that is what went into these babies! But that’s when things got creative. See, I didn’t just want to make regular pancakes. After see that cute little honeycomb jar of mine, I ran with the idea. I was going to shape my pancakes like a beehive. 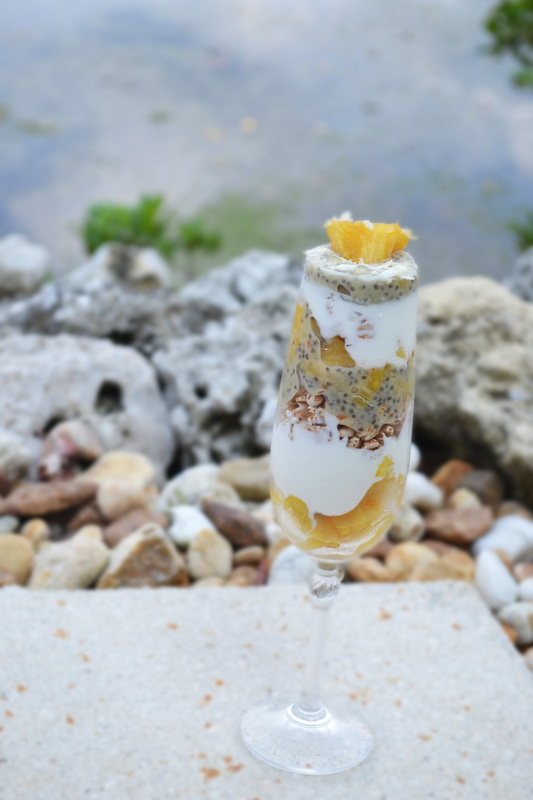 And what better way to finish off this creation then to add a couple of little bees as well to the dish? The result was the cutest stack of pancake that I ever had seen! Unfortunately, they didn’t stick around too long to admire as my mom and I devoured them very quickly. And guess what? These are competition WINNERS. Just today I found out that the creative pancake competition I entered these cute little pancakes in, WON!! 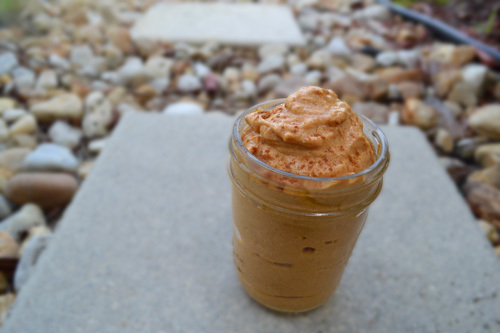 The lovely taste of peanut butter and honey, the cute creativity that is so fun and pleasing to the eye, and the healthy aspect of it all..why not make them?! Made with peanut flour and raw unprocessed bran, natural protein powder, and coconut flour, these pancakes are filled with protein and fiber! 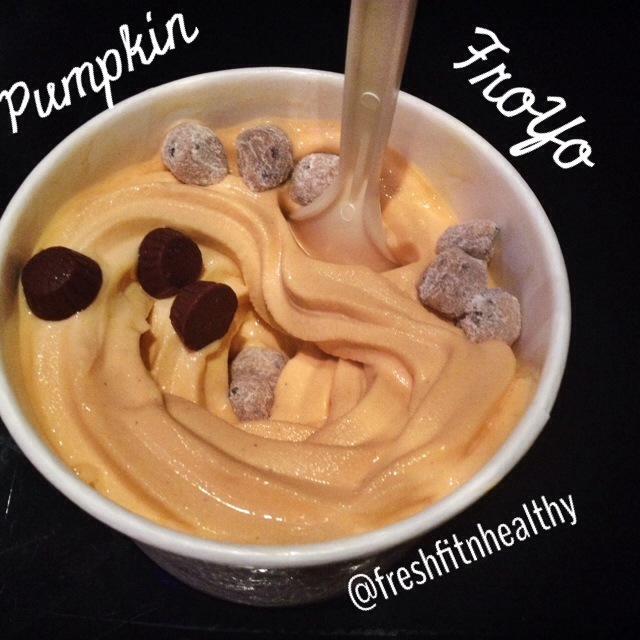 For one serving (makes two here), there is 11 grams of fiber and 30 grams of protein! I usually do not provide nutritional information as I do not count, but this recipe was featured on a site that does count, so the information will be below the picture! Directions: Combine all pancake ingredients together. Cook in hot pan on stove ( this is where you have to perfect your “moon” shaped pancake making). Make half moon shaped pancakes and half normal circles. Blend all sauce ingredients together. Stack pancakes as seen in picture, reserving one pancake for cutting “bees” out of. Top “honeycomb” with sauce. Cut out bee shapes in leftover cake. Submerge in sauce. Use cacao nibs and cut raisins for decorations. Enjoy!